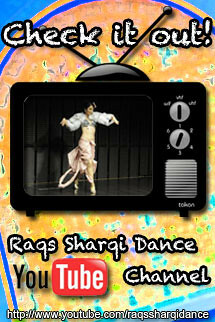 ← Oreet New Raqs Sharqi DVD is released!!! American Raqs Sharqi dancer Rasa Vitalia tells about San Francisco Carnaval Parade 2010. On the warm, bright morning of May 30 we were on a mission to awaken and share a very unique element of the abundant multi-culturalism alive in our city. As the only Middle Eastern Belly Dance Music and Dance group represented, we were determined to be a contingent that no one would ever forget. 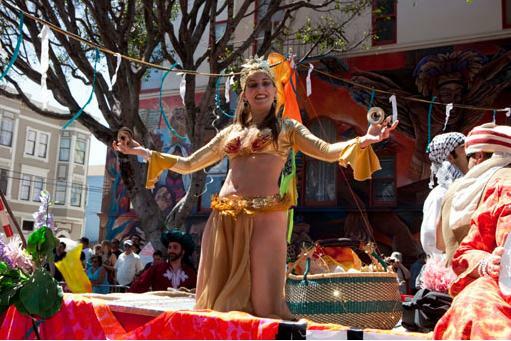 I have been a dance artist and performer in the San Francisco Carnaval parade, festivals, shows and contests since 2000. This hard work and reputation had paid off when a float and stage spot was offered to me quite unexpectedly by San Francisco Carnaval office’s Eco-Green Village subsidiary. Excited about this creative opportunity to bring our dance form to a large audience, I took it upon myself to focus my energies on really putting this show on the road, literally! From my past Carnavale experience, I knew that predominately the parade was inspired by similar Brazilian and Latin American cultural festivals and that it would be unusual but essential for us to bring something different to the table. We would contribute a winning float of festive Middle Eastern cultural dance and music. The float concept was “The Eco-Green Village Oasis” with the idea that this would be a desert Oasis where dancers and musicians had gathered. It was important to me to present our dance art in the best and most professional way. And so, after many phone calls and emails, I managed to gather the talents and most welcomed generosity of 9 musicians and 5 beautiful belly dancers, each who arrived on site in wonderfully matching colors and costumes according to our Middle Eastern theme. All contributed to the cause! The music was orchestrated by the masterful Philip Gabriel, conductor and oud player of the group Flowers of the Nile. Our enlisted musicians were Jean Folger, Khatchadour Khatchadourian, John Landers, Rebecca Matthews, Dafir Ouazzani, Soozhy Q, Victor Rosales and Leland Thunes, playing a traditional mix of doumbek, riqqs, and keyboard melodies. All these musicians came together to rock the street and fill the beat! To contribute their shimmies, colors, and enchantments were the beautiful dancers Sonia Belliview, Myisha, Pat “Aishah” Rusich, Ellen Adam Strommen, and Karen “Najma” White. The dancers all looked so glorious in their colorful costumes and veils! It was a great experience to work with each and every one of these talented performers. As parade time was nearing, the whirl of delightful anticipation encompassed us all during the morning’s 4-hour prep time. Lots of photos and press, quick rehearsals, stretching, final organization, float decorating, frantic search for water bottles, last minute costume adjustments, giddiness, and more! Finally, the parade commenced and our float joyfully approached the scene and started down 24th Street. You could undoubtedly feel the excitement and serge of energy. Wow! The sidewalks were filled with people for blocks and blocks! Ecstatic, our team put on our best show. We danced, sang, played music, laughed, and really had fun! I was so impressed with my dancers stamina as they danced and shimmied in the hot sun for over an hour and a half. The crowd responded with high enthusiasm, shouts of joy, belly rolls, shimmies, and delight! As we passed by the judge’s risers, the announcers stressed how much they appreciated our presence, diversity, and Carnavale spirit! I was so proud of the professionalism, quality and tremendous good energy maintained throughout the parade by all of my friends, and to have had this opportunity to raise awareness of the beauty and celebration in the Art of Middle Eastern Bellydance. After the parade, several musicians and I even soldiered on to perform an hour-long show with other dance groups in the line up at the Parade Festival. Whew! It was a wonderfully full and exciting day in paradise on “The Oasis” in the name of Belly Music & Dance! Mission accomplished, everyone! Freelance Internet Marketer/ Bellydance Japan Magazine Writer/ Raqs Sharqi -The Joy of Dance- SNS Managerとして活躍中。 2010年には、ベリーダンスイベント運営/ Marketing戦略立案施行を行うRaqs ART Internaitonalを立ち上げ、Suhaila Salimpour, Huleya HiromiのSNSの運営管理、インターネットにおける市場戦略立案施行を行う。 I hope that Raqs Sharqi -The Joy of Dance- promote every Oriental/Middle Eastern/Belly/Raqs Sharqi dancers and everyone who loves dancing sisterhood! This entry was posted in American dancer and tagged belly dance, Carnaval 2010, Oriental Dance, Raqs Sharqi, Rasa Vitalia, San Francisco. Bookmark the permalink.